Compact, rounded, very slow growing evergreen conifer. 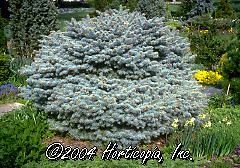 Dense, powder to bright blue foliage, grows in globe shape. Produces a striking specimen when grafted on a standard.